The fishing will always be better round the next bend of a river, on the other side of the lake, or in the spot with the No Fishing sign. That was why I tramped past the spot I fished on Friday to get to eel Nirvana. The grassy bank perfect or setting up on, rods poking through a wide clearing in the reeds with just enough height to provide some cover. The overhanging trees providing the eels with a sense of security. Just the right kind of weed for prey fish to find attractive but not thick enough to prevent good bait presentation. It would be worth the walk, especially as I had slipped the brolly in the quiver to combat the rain that was due, and starting to fall as I arrived. What I found was a jungle. Almost impenetrable, but not quite. I found a couple of spots where I could poke a rod or two over the water. One was ideal, apart from the mat of blanket weed extending a rod length or more out from the edge, and more of the stuff further out rising up in clumps. I looked at another which seemed clearer. Rather than set up I had a few casts around with an unbaited rig. The bottom was covered in blanket weed. The dark green, hairy stuff that clocks up run rings and festoons the hooks and bait. Only one thing for it. retrace my steps and fish the same swim as last time. When I'd packed away on Friday I couldn't find my forceps anywhere. I took it as a good omen when they were there in full view when I got to the swim. I still have a pair of forceps that I left near that spot when I was about sixteen, returning the next day to find them where I'd unhooked a jack. Definitely auspicious. The baits went out to the same spots as before, this time over sprinklings of small trout pellets as I had no maggots. There was a warm south-westerly blowing, ruffling the surface but not causing a chill. It was quite a breeze and the flag leaves would occasionally brush a line and make the alarm sound. Not much in the way of bird life showed itself. I'd seen a solitary reed warbler on my previous session, but there was no sign of it. Not even a reed bunting, a bird that's around all year but seems more a part of autumn and winter when the reeds die back, fading to the same colours as the bird's plumage. When the light had faded to the point where colours begin to disappear a slack handful of swallows zipped past at low level. Shortly after a single young bird alighted briefly on the flag to my right, leaving almost instantly either disturbed by a sudden movement I'd made or the swaying of the leaf in the wind. 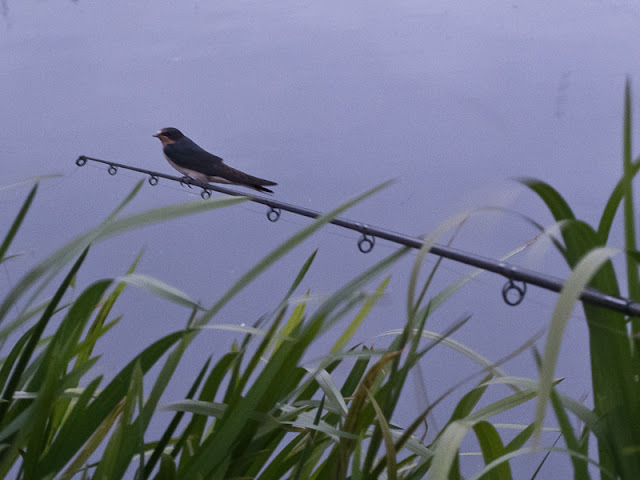 It then returned to land on my right hand rod where it perched looking a little lost and bewildered for long enough to allow me to get a camera out of my bag and take a very rough photograph. I wondered if it had been a part of the small flock that had flown by just before it appeared. There was no sign of the wind dying down, if anything it was strengthening. The intermittent bleeps from the alarms became more frequent. what I'd taken to be a wind bite developed. The right hand bobbin was moving upwards in fitful jerks. I struck and hooked another eel of a size that was less than encouraging. As soon as it was in the net and I lifted the mesh from the water the wind caught it and blew it into the reeds and flag! Iwasn't sure if the eel was still in the net, but it was. With a fresh bait recast I tidied the swim, propping the landing net back in the reeds to my left. The lost-and-found forceps were on my chair, so I picked them up to clip them back on the mesh of the net where they reside. At which they snapped. 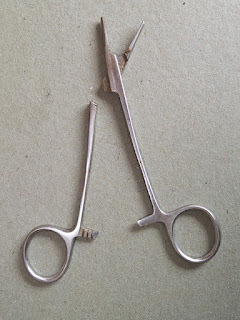 They don't make forceps like they used to! Should I have landed another eel there was still a spare pair in the ruckbag. The clouds heading my way thickened in the south. I felt drizzle. Probably a passing shower, but for some reason I'd had enough. With the gear packed and on my back I set off into the wind. The drizzle got heavier and I almost wished I'd put my waterproof jacket on. The drizzle abated. When I arrived home the clouds were breaking up. I had the rest of this week all planned nicely. Then my printer packed up. Yes I have tried switching it off and back on again... I have also tried the other potential cure - hitting it. A lack of a printer wasn't a pressing problem, until I realised this morning that I need it to print labels to send parcels out. So I'm off on a printer safari. If it fails I'll have to resort to ordering on-line and wasting a day that was to be spent fishing waiting for the bloody thing to turn up.